Daily Photo 2009: Read, please. This happens many times throughout the day. Zack's books are all on the lower shelf, so he makes a beeline for them any time we're in his room together, takes them all off the shelf and hands me the ones he wants read to him. The one in this photo is The Very Hungry Caterpillar by Eric Carle. I usually read that particular one about four times a day. 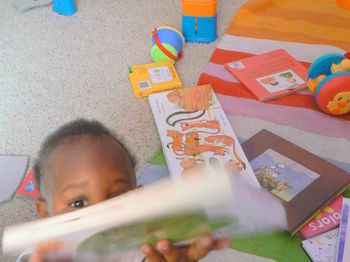 I'm happy that he loves books, but I hide them away a couple of times a week to give myself a break from perpetual story time and so he can play with his toys and do more exploring.